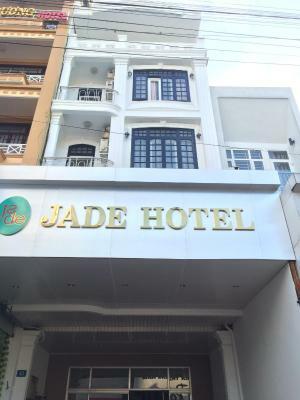 Lock in a great price for Jade Hotel – rated 9 by recent guests! 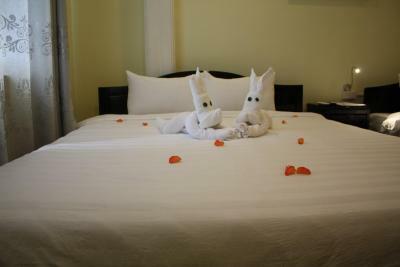 Everything was really great - stuff were extremely nice, breakfast was excellent, room was spacious, and it was clean! Smiling, friendly staff went out of their way to provide service. 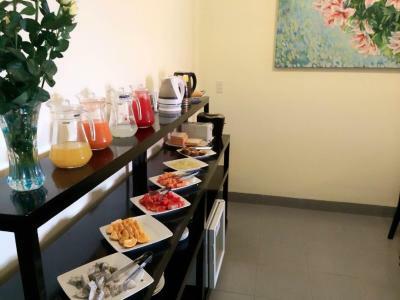 Breakfast was excellent with many choices and unlimited unlike the two other bookings.com hotels I stayed in. Great value for the money! Wonderful staff! 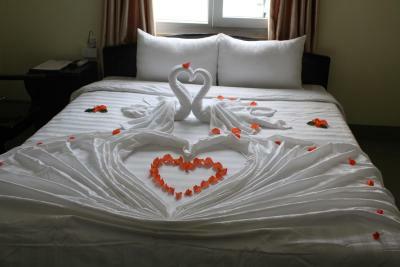 Hang and Tina and the entire staff did everything to make our stay happy and comfortable! They were so friendly, helpful and delightful! 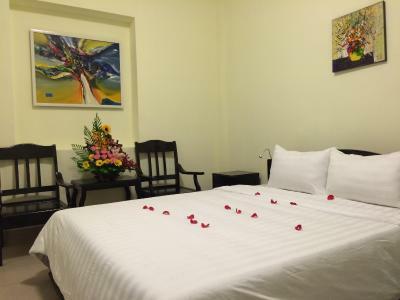 The hotel was close to great restaurants, coffee shops and only a 5 minute walk to the river or the tourist center..The room was small but the bed was comfy and the air con worked great. Pleased that there was a room safe. Tina planned a great day tour for us that worked like clockwork! Loved it. Thank you Hang, Tina and the entire staff of Jade Hotel! Oh my gosh!! Everything was so wonderful. A budget hotel where they treat you like you’re at a 5 star resort. 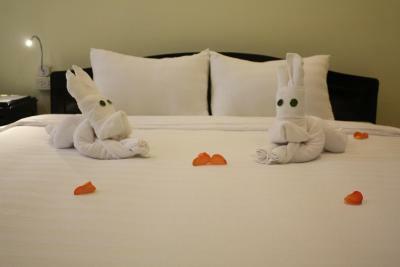 So many thoughtful little touches and beautiful clean rooms. Don’t stay anywhere else! Breakfast was AWESOME. The most friendly staff. They helped us with everything and made sure we knew where to go in addition the the breakfast was good and the hotel was in the middle of everything. Awesome breakfast, friendly staff, great location. 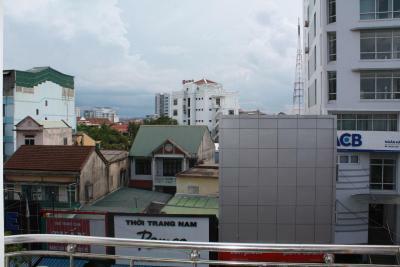 Location was just a 5-10 minute walk from walking street, where most of the cafes, restaurants and bars reside. Upon check in, we were greeted with orange juice and delicious cut fruit! The receptionist was very kind, spoke perfect English and was very helpful. The bell boy was so kind and took our bags first up to our rooms when we arrived, then to the taxi when we left. 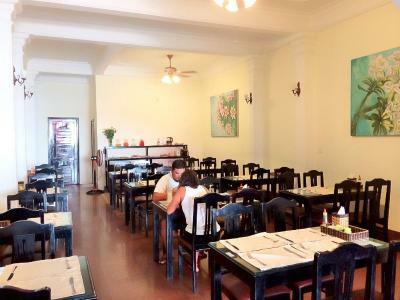 Great location, amazingly helpful friendly staff, great food. 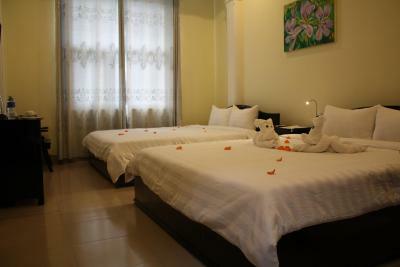 Trang was very caring and helpful- Fantastic stay! 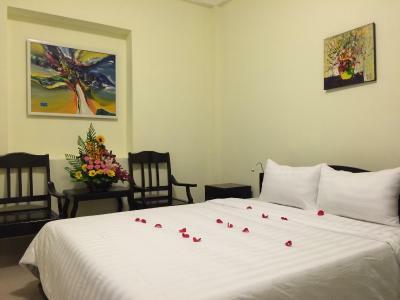 Jade Hotel This rating is a reflection of how the property compares to the industry standard when it comes to price, facilities and services available. It's based on a self-evaluation by the property. Use this rating to help choose your stay! 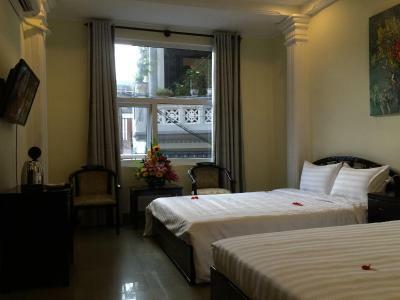 One of our top picks in Hue.Located just 0.6 mi from Dong Ba Market Jade Hotel offers accommodations in Thua Thien, Hue. Guests can enjoy a meal at the on-site restaurant, or simply lounge at the sun terrace. 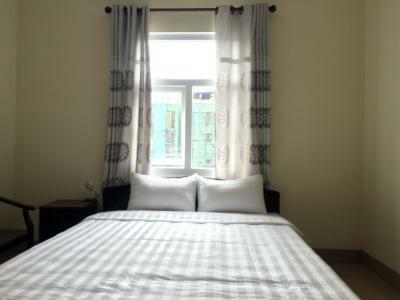 All rooms are fitted with a TV for entertainment, and are fitted with a private bathroom with a bath or shower, with slippers and free toiletries provided. This accommodations features free WiFi and private parking. The hotel also offers bike hire and car hire. 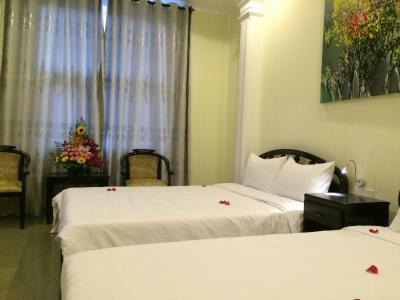 Trang Tien Bridge is 0.6 mi from Jade Hotel, while Chieu Ung Pagoda is 1.1 mi from the property. Phu Bai Airport is 8.7 mi away. 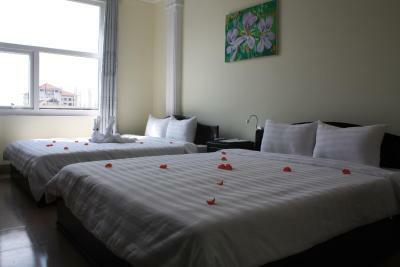 When would you like to stay at Jade Hotel? Please note this room does not have a window. This twin/double room has air conditioning, mini-bar and tea/coffee maker. 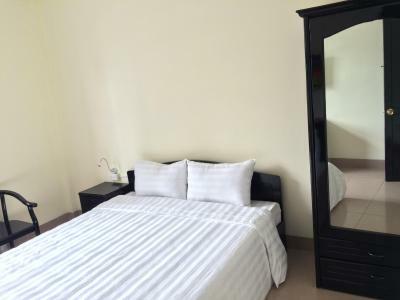 This twin/double room features air conditioning, fireplace and mini-bar. 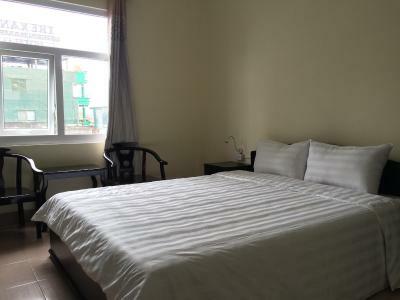 This triple room features a tea/coffee maker, fireplace and air conditioning. This family room features a fireplace, mini-bar and view. 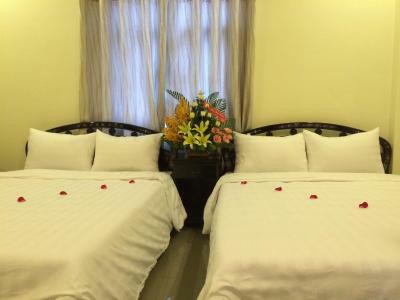 House Rules Jade Hotel takes special requests – add in the next step! Jade Hotel accepts these cards and reserves the right to temporarily hold an amount prior to arrival. I was received with a platter of fresh fruits. Much appreciated in a hot weather. Tram, one of the employees, was extremely helpful. She organised a special visit to the temples at unusual hours and at a very reasonable price. 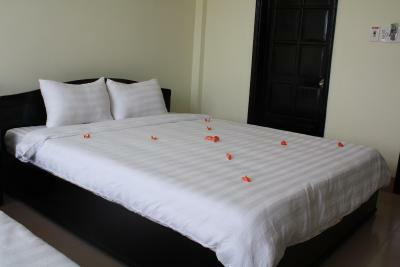 All the personnel was very courteous.I would not hesitate to recommend this hotel. Excellent and helpful staff - we were here for one night and we received excellent assistance particularly when we needed to book an airport transfer at awkward hours. It's amazing how little I paid for the room! 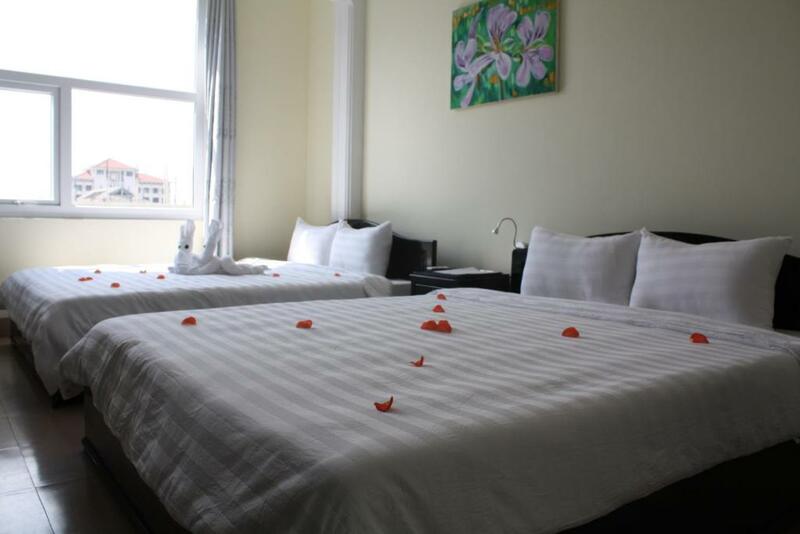 The staff was super nice and helpful, the room clean and breakfast very decent. Nice, hot shower (you just need to remember to switch the hot water on a little earlier - pretty standard thing in Vietnam, I've noticed). They welcome you with free fruit, juice and coffee. They checked me in early - much appreciated after the overnight train. Really great value for money. Staff were exceptionally kind and welcoming. We’re readily available to suggest restaurants or arrange tours. Amazing stay at Jade Hotel! The staff are exceptional. They are happy, helpful, efficient and speak good english. The hotel has an atmosphere that really makes you feel welcome and valued. One of the best in this genre. If I was being picky I’d just say about the kettle plug wire being longer as it couldn’t reach the wall very well. Staff were unbelievably lovely, a young team and always smiling! Trang is fluent in English and so very helpful! They couldn’t do enough for anybody they were always making sure you were comfortable during your stay or asking if you’ve had a good day/ giving you ideas or helping with directions etc! We were welcomed after our horrendous 13 hour journey from Hanoi with big smiles and some fresh juice and fruit ready for us even though we were very early for check in. 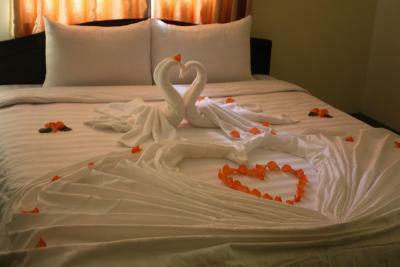 They did everything to make sure a room was ready for us as soon as possible and we weren’t waiting for long! Our room was great in size complete with hairdryer, fridge, safe, complimentary water and coffee, towels, toiletries, bath, tv! Bed was super comfortable, Shower was powerful and hot, breakfast was buffet style which was great so you could have a few coffees or even when you had something cooked they asked if you’d like anything else which seems to be rare in Asia! The location is honestly fine if you’re like us don’t mind a 5 minute walk to the busy area with the bars/ restaurants and plus they have a great on site restaurant which can do room service which is surprisingly very well priced! All in all we loved our stay here and would recommend to anyone! The hotel in itself was quite normal but the staff was excellent. The service and staff were amazing from the minute we arrived to the minute we left. By far the best place we have stayed in South East Asia. Breakfast was also excellent and so was the lunch and dinner menu. 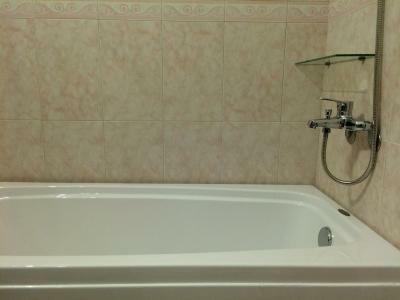 Whilst good value for money the bathrooms could do with a little updating. Not the worst but starting to feel a little tierd.